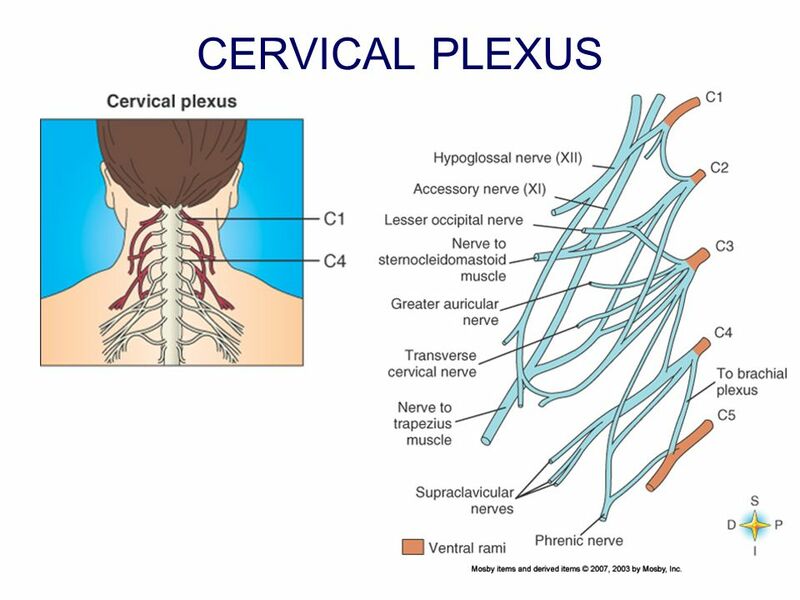 「　The cervical plexus is a plexus of the ventral rami of the first four cervical spinal nerves which are located from C1 to C4 cervical segment in the neck. They are located laterally to the transverse processes between prevertebral muscles from the medial side and vertebral (m. scalenus, m. levator scapulae, m. splenius cervicis) from lateral side. There is anastomosis with accessory nerve, hypoglossal nerve and sympathetic trunk. It is located in the neck, deep to sternocleidomastoid. Nerves formed from the cervical plexus innervate the back of the head, as well as some neck muscles. The branches of the cervical plexus emerge from the posterior triangle at the nerve point, a point which lies midway on the posterior border of the sternocleidomastoid.